Each step in the application&apos;s flow accepts input data and returns output data. The output data can be used by other steps with in the flow. 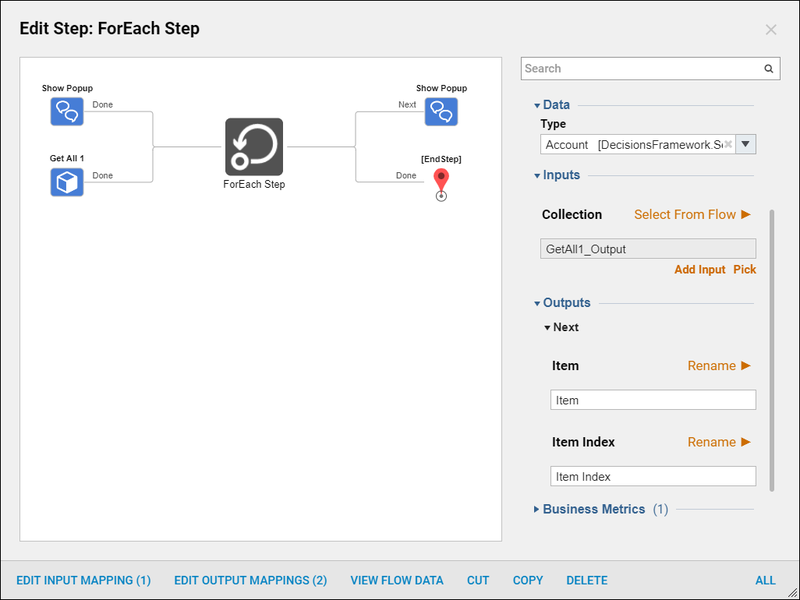 For some steps, input data can be provided from multiple data outputs that exist in flow. 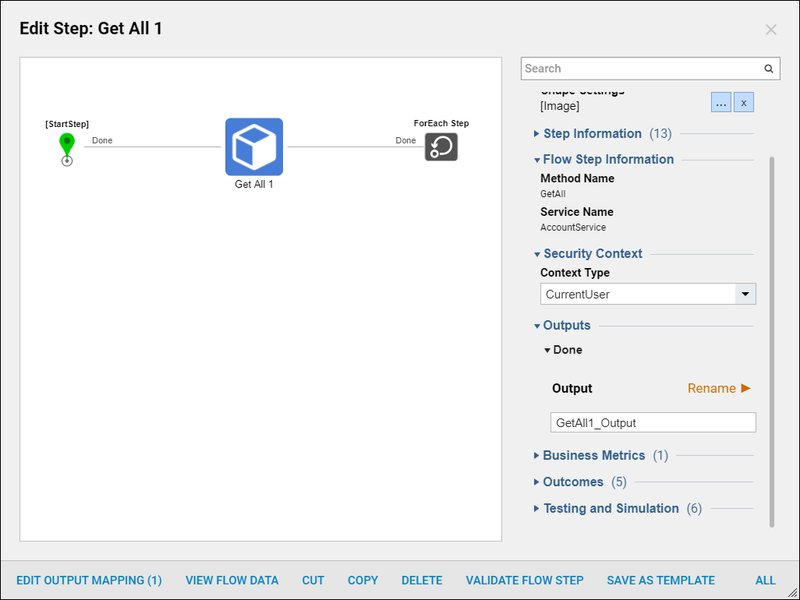 Use the Mapping Editor to select a data source that you would like to use as an input for a selected step in your flow. You can also define how these inputs should be used before proceeding to the next step. To access theMapping Editor , select a step in the Flow Designer work space then click the Edit Input Mappings	or theEdit Output Mappings	link in the Actions	toolbar	. 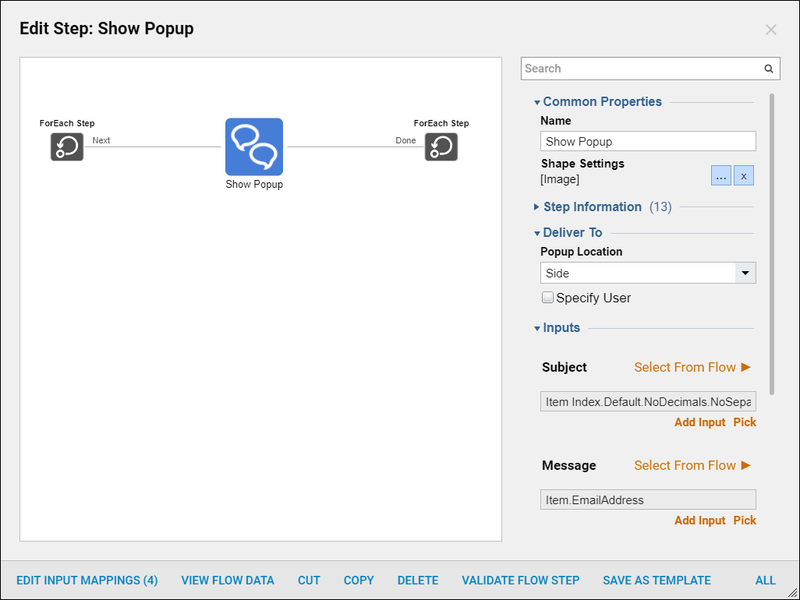 In this example, create a flow that grabs existing Decisions&apos; accounts and displays their email addresses on a popup. Add a Get All	step from Integrations > Internal Services > Accounts	. Next, add the step For Each Step,	this will accept an array of created accounts . To ensure that this is the case, double click the For Each Step	in the work space. Within the Edit Step dialog,	set Data Type to accounts. The Actions toolbar	is located on the bottom of the Edit Step	dialog, selectEdit Input Mappings. The available data inputs for the For Each Step	are located on the left side of the screen. In this example don&apos;t rename or transform any data before passing it into the For Each Step	. On the left side of the input mappings view, is a list of possible data sources with their internal parameters. On the right side there is an empty collection object that is waiting for a data input to get mapped to it. This means that the application knows the For Each Step	should expect a collection, or list, of data as its input. However, it does not know what that data is or how it should be used. To specify which data source will be used as the input for the For Each Step,	drag a connection from the intended source to the empty collection data input. Assign the GetAll1_Output	array as the input for For Each Step	. Now the flow knows that it should expect the input to come in the form that was determined for the Account array**. **	Designers can also determine how exactly the For Each Step	handles this data. In this example the data needs to remain unchanged going to the next step, leave its mapping type as Select Value. If required designers could use the data differently by treating it as a constant, exposing its input, nullifying, ignoring, or any of the other input collection options available. Add a Show Popup	step on the Next	path from the ForEach	Step. The Actions toolbar	is located on the bottom of the Edit Step	dialog, selectEdit Input Mappings. For the Popup Message select Item.EmailAddress	, to show the Account email address within the Popup. Next select Item Index.Default.NoDecimals.NoSeparators	to show the number reflecting the order of the email address. Select OK	to close. Save	the flow and select Debug	in the top Action Panel. Run the Debugger by selecting the play icon. The flow runs and the pop ups properly display the email addresses and order of accounts.